On July 14th, a group of about fifty women and men took to the streets in Kabul to protest agains harassment by men in public places. For Afghanistan, this was a first, and represents a new generation of young Afghan women and men. The event drew the attention of the international media. "The protest walk started from Kabul University to the offices of the Independent Human Rights Commission of Afghanistan", explained 19-year-old Noorjahan Akbar, feminist activist and student. "We held signs and pamphlets and flyers on street harassment were distributed. We were interviewed by the media and spoke to local men and women about street harassment.."
In an interview with Safeworld, Noorjahan told Clara Boxall, "Our protest walk has grabbed the attention of people in Afghanistan and around the world, and local Afghans are starting to recognise street harassment as a problem". "Women rarely go to the police for help on street harassment and sometimes the police themselves are the harassers, but during our protest walk the policemen were very helpful. They walked with us, helped in distributing flyers and even talked to passers by about the objectives of our walk." Noorjahan is co-founder of Young Women for Change, which aims to fight the deep-seated beliefs that underpin the oppression of women in Afghanistan. Her parents are very supportive of her activism work and her education, but she feels that the majority of parents are still not ready for young women to engage freely in society. "There are more women going to schools and universities and it is more accepted by the community." 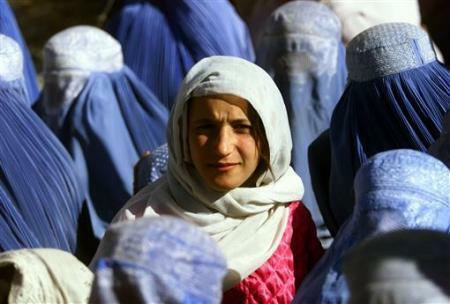 In rural Afghanistan, young women face greater challenges and dangers. A lack of female teachers and safe transportation makes travel difficult. There is also little interest in protecting girl’s schools and supporting female teachers. For girls travelling to school in rural areas, dangers can include physical assault, including acid attacks, and even kidnappings, says Noorjahan. Noorjahan is outspoken about the reasons behind oppression of women in Afghanistan. For example, the religion forbids a marriage without the woman’s consent, but the culture permits it.... Around seventy-five per cent of marriages in Afghanistan are either forced or child marriages. Islam also allows women to vote but the majority of Afghan women are not given ‘permission’ to leave their homes to vote, according to cultural believes. Culturally women are also denied their rights to worship in Mosques, and this is in opposition to Islamic law." Noorjahan believes this is because, in Afghanistan, the religion has been mainly interpreted by men. "The vast majority of women are illiterate and cannot understand the Q'ran. Therefore any interpretation done is by men only and in this way, men have taken advantage to guarantee their dominance within the society." Noorhahan is optimistic: "This will change when women start taking part in interpreting the religion and learning about feminism and women’s rights through Islam." Young Women for Change holds monthly lectures on women's rights, which are based on Islam and the Afghan law. "Using Islam and the law to prove that street harassment is not related to women’s clothing, and is rather a backlash against women’s participation in the society and it needs to stop." "Many things have improved for women since the fall of the Taliban, however this progress is mainly limited to the urban areas and this progress could be threatened again. At the moment negotiations are being made with the Taliban and some freedoms have already been taken away from women, and this could further compromise women’s rights and the freedom that we deserve." In a recent TrustLaw poll, Afghanistan came out as the most dangerous country in the world for women. Noorjahan believes this is accurate. "Ninety per cent of Afghan women face domestic violence," says Noorjahan. "A lack of judicial and legal support for abused women and recent regulations on women shelters make it even harder for women to seek help and protection. "Several women’s rights activists have been murdered and there has been no justice for their cases. Ama Safia Jan and Nadia Anjuman are amongst those murdered." Noorjahan, like many other Afghan women, has strong views on women and the peace process. "Currently there are only nine women members in the High Peace Council and women are given very little voice and representation in the peace process because our fates are being decided by men, who have destroyed this country and violated our rights for decades." She is critical of the attitude of the government towards women's rights. "The Afghan government does not have a stable policy towards women’s rights and human rights. "The laws that do protect women are not widely implemented and part of the reason for this is due to the small number of women in the judicial system." "It is important to keep women’s issues on the table while the government is focusing on negotiations with the Taliban. The majority of the Afghan women I meet these days are afraid that their fight for equality has been abandoned by their former international allies.